SO first, I will tell you why this book took FOREVER. I originally wrote Dark Moon (over a year ago), believing it was the story that needed to be shared before the final book. Before Full Moon. Until I began writing Full Moon. It was almost impossible to come from the angle I wanted to and I kept feeling this writer’s block even though I had the story, so clearly in my head. I sat back for a couple of days trying to figure out what the problem was. Then it hit me! Bam, smack in the face. “How had I not realized this sooner?” I asked myself over and over. I feverishly began texting with some of the coolest beta readers I know (who had already read Dark Moon forwards and backwards), to ask their opinion. Tell them my dilemma and where my head was. Presto…we all agree. Dark Moon COULD NOT be told first if Full Moon was to have the same suspenseful impact. And there is was. The decision to put Dark Moon at the very end of the series and my fingers couldn’t type fast enough. Three days and 195 pages later, I had the first draft done! But then the real work started and that brings us to this point. The final touches. The cover, the interior, the primping and making perfect all the parts to put it into your hands. Which I promise is just within reach. After years of abuse sent her running to the west coast, Lexie returns to York, Maine for one final deed…to bury her father. Only, rather than the closure she hopes for, she finds herself sliding faster and faster down a rabbit hole of secrets. Secrets she never imagined could be at the core of everything she’s so desperately tried to make sense of. At the heart of it all…her sister’s killer. Remember Claire and Brian Stone from Harvest Moon? Yeah you know the ones…Lexie’s no good abusive parents? Well they are back in a way you never imagined. Dark Moon is on the horizon and will be told from Claire’s point of view. The inspiration for this short little novella was actually all the loyal readers who kept asking how it all began. Why Claire stayed with Brian when she clearly hates him. Why she chose to have two daughter with him. Two daughters she seemed to loath more than she loathed Brian, and that says a lot. Claire grew up isolated; a secret her parents kept after a desperate attempt to shut out the cruel world that had wronged them. But at fifteen years old, Claire’s desire to step beyond the boundaries of her parent’s seclusion outweighs all consequences she may face if caught. When Claire’s scheme to be set free becomes a reality, it’s Brian who promises to help her, protect her even. Until Brian becomes just another pawn in Claire’s evil charade. Dark Moon is a short novella that parallels Claire in 1991 at fifteen and Claire in 2007 and will come with a disclaimer similar to Angela. 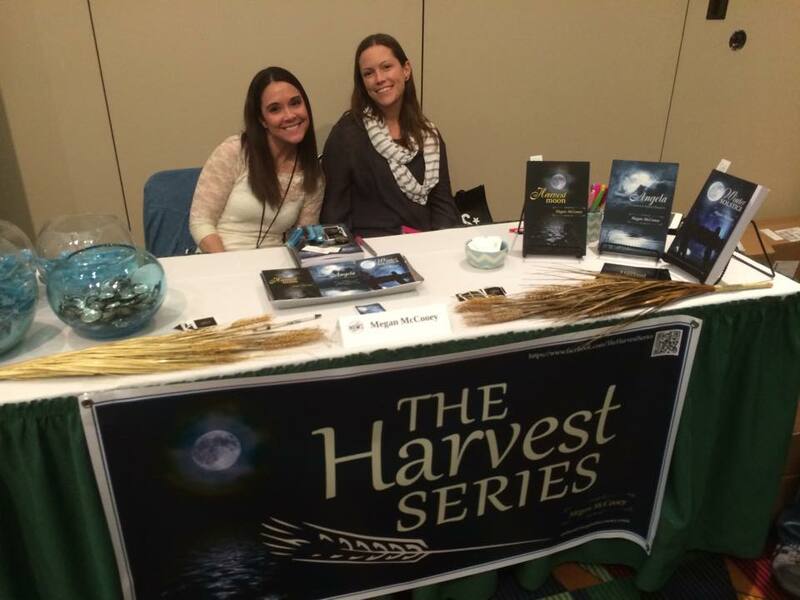 While all of the books in The Harvest Series are targeted toward young adults, some of the content in Dark Moon is rather edgy and intended for an older teen audience. Now with Dark Moon just about ready to go, Full Moon, The Harvest Series, #3 will be top priority. But one thing you should know…you have to read Dark Moon BEFORE you read Full Moon. It’s imperative. Now, with that said, if there’s anyone who can’t read Dark Moon, this doesn’t mean you will be lost in Full Moon, but Dark Moon paves the way for a lot of the Stone family secrets that will emerge throughout Full Moon. While you’ll still see who, what, when, and where… you won’t necessarily understand the WHY! And that’s all I will say about that. As of now, Dark Moon will be out sometime this summer. Hopefully by July, maybe sooner if everything falls into place. 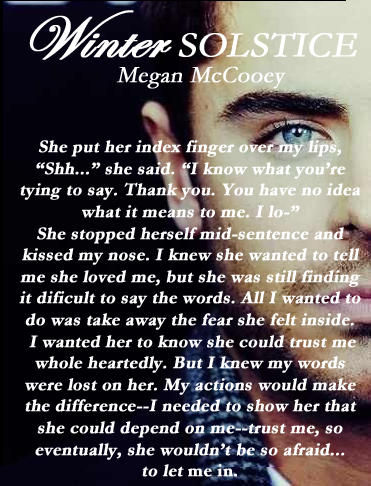 Please feel free to send me an email me at author@meganmccooey.com if you’d like a signed copy once it’s released and I will get the invoices sent out just as soon as we are ready to publish! 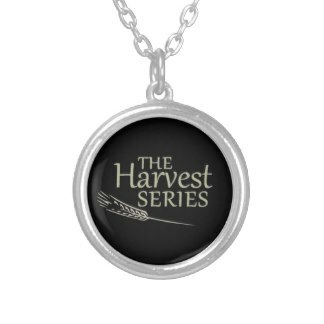 And if you haven’t started The Harvest Series, now is as good a time as any… so take a look around and feel free to comment, email or reach out to me in any way. 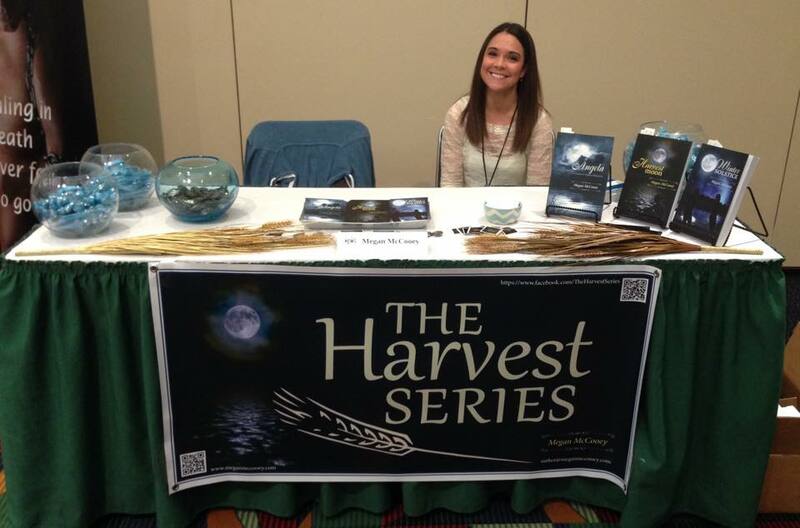 The Harvest Series… What’s NEWS!!! Let me first begin by apologizing (as usual) for not being more active these past few months. 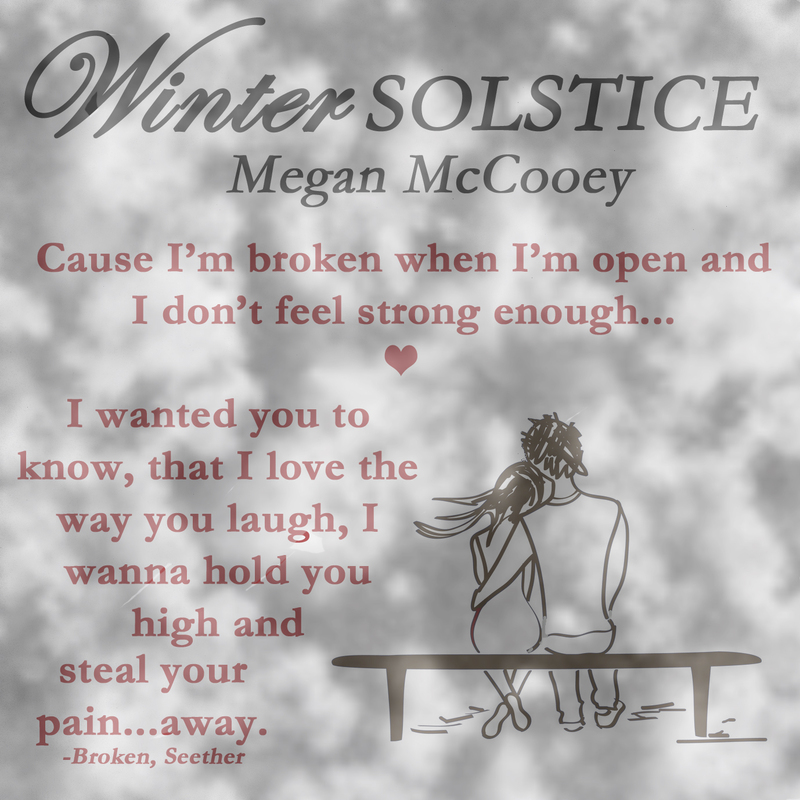 With the dual release of Winter Solstice and Angela, plus my first book signing, you’d think I would have been racing back here to shout it out from the roof tops…unfortunately life got in the way as it usually does. 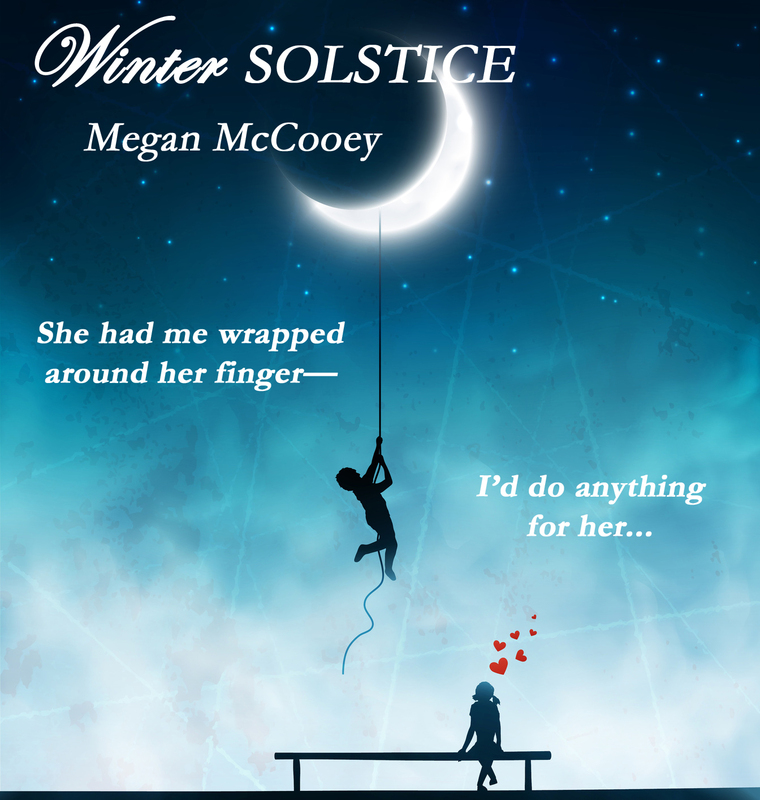 The release of Winter Solstice and Angela went wonderfully and the few reviews that have trickled in so far have been wonderful. Keep your eyes posted for a few of them here in the next few days. Second, I can’t wait to share some photos from the New England Writer’s Signing (NEWS) that was held in Worcester, Ma in October. It was so fulfilling to experience this kind of thing with so many great authors, to meet an abundance of dedicated readers, and make some new friends. I am so grateful I was given the opportunity to be apart of it and I look forward to many more in the future and I hope to see some of you along the way. 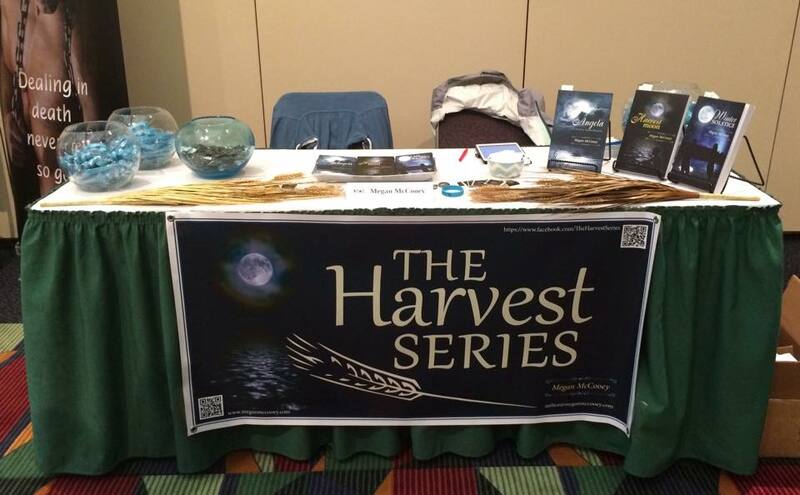 As for news for the series, you will be happy to hear I have started working on Full Moon (The Harvest Series, Book 3) as well as Dark Matter (A Harvest Series Novella). I have decided to finish Dark Matter first only because it sets a much needed foundation for Full Moon. Dark Matter, will be told from Claire Stone’s (aka: Claire McIntire- Lexie’s non-existent mother) perspective during the summer she gets pregnant with Angela!!! You will finally get to see where her darkness comes from and why she is such a cold, unloving woman… but, be patient… you won’t get this installment UNTIL AFTER Full Moon, otherwise all the secrets would be out in the open with no real suspense left. 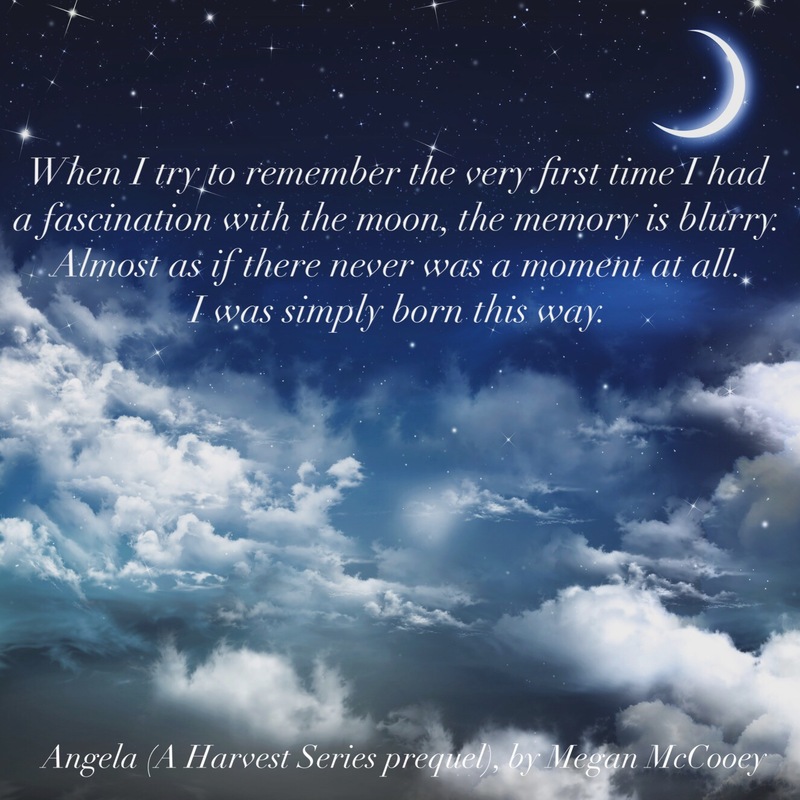 I promise you though, the anticipation and secrets you’ve been waiting to uncover since you began reading Harvest Moon, are sure not to disappoint. Some really dark and twisted things are in store for Lexie to uncover as she navigates through the hell she called a life for seventeen years. She’s already overcome so much…but she has no idea what she’s about to stumble onto or how drastically everything is about to change!!! Okay so now lets share some great photos!!! 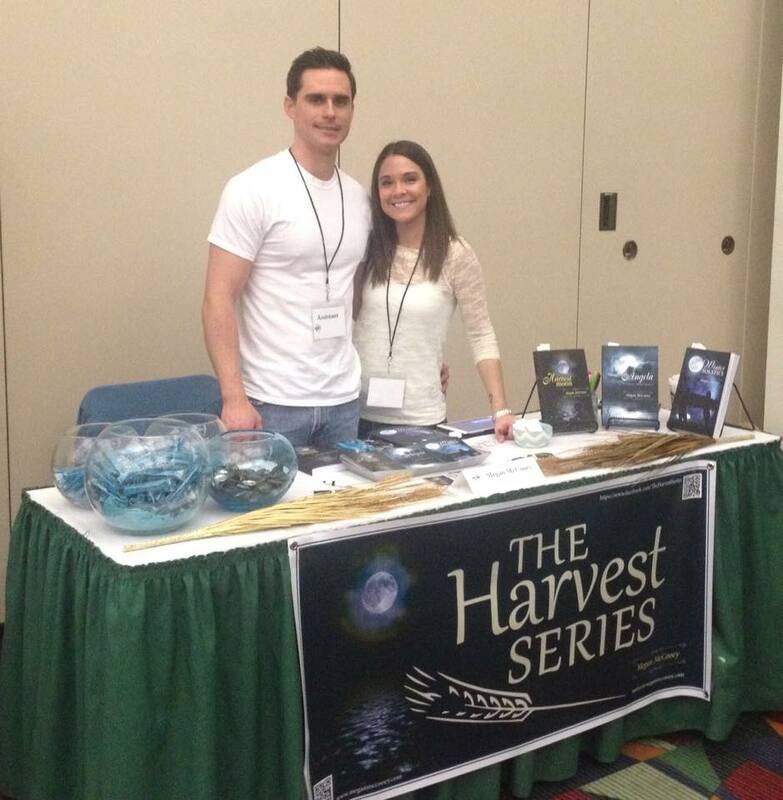 The lucky winner of the Harvest Series Giveaway at the event. 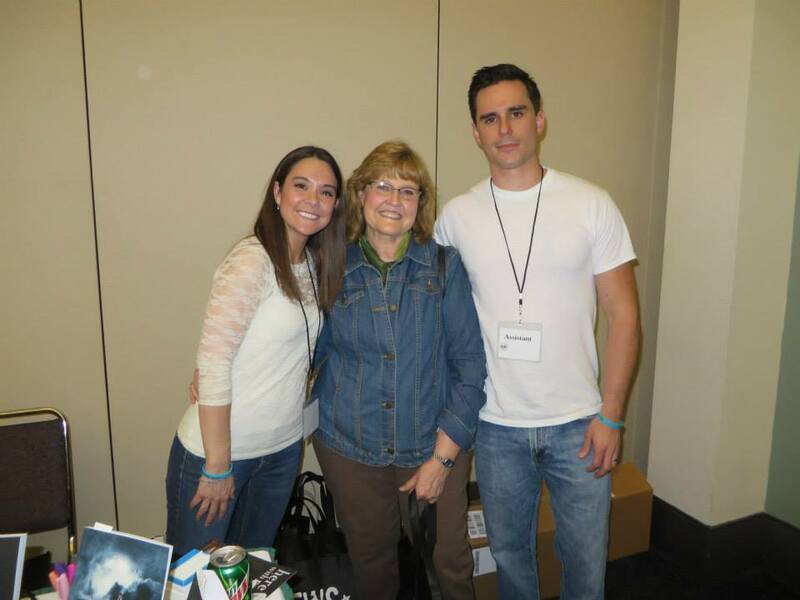 She won all 3 books and a ton of swag!! Congrats Charlene!!! Me and Caitlin again! 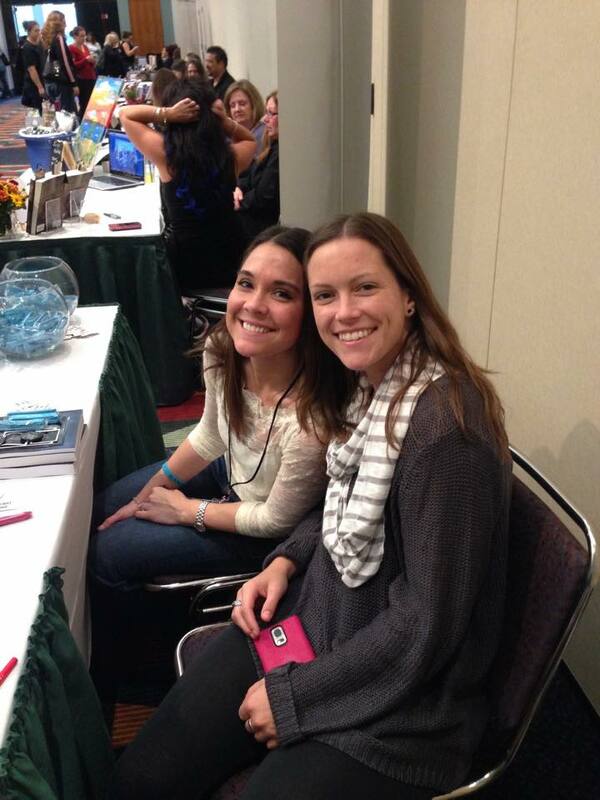 Love this girl… true character inspiration is the BEST! 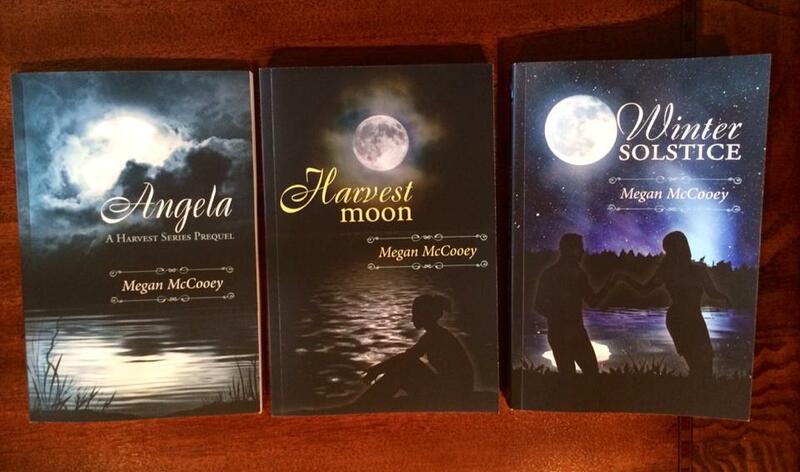 The first 3 books in The Harvest Series. Thanks Judy Davison for your incredible cover art, which was the talk at my table… so many compliments and people coming over just to look at them!! 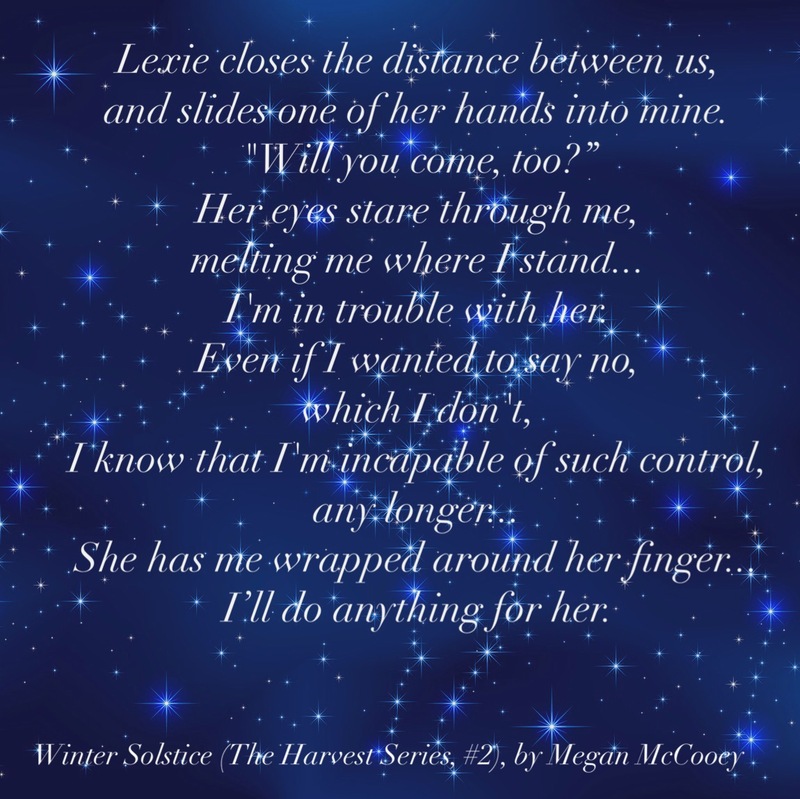 The time is quickly approaching for the dual release of Winter Solstice (THS, #2) and Angela (THS, prequel). Soon you’ll be seeing links for pre-ordering both books and I can hardly wait to share then with you. 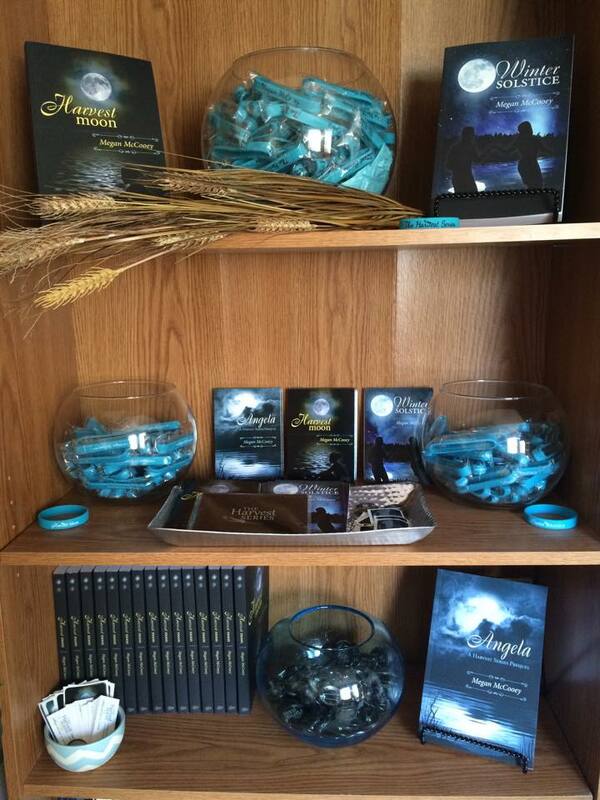 So we all know Winter Solstice picks up where Harvest Moon leaves off—literally… but Angela, is a special little book. She’s only around 70 pages, so a quick read. But she is a very emotional book and won’t be for everyone… and it’s not because it’s not a great story, but more so because it’s hard to read. We already know so much about Angela through Lexie, but in this short prequel, we get to know her from a more personal side. 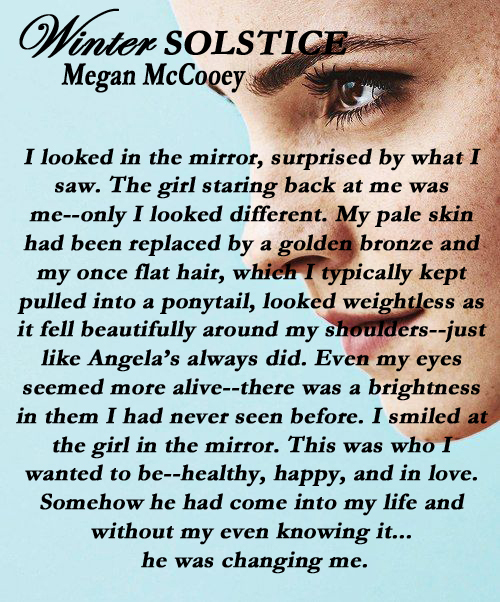 The story is told from Angela’s POV and brings the reader back to 2006, the year before she dies—and follows her through to the night 2007, when she is murdered. After having several ARC copies go out, I can say there were some very heavy emotions in the responses. Most understood the need for this prequel—it’s integral to the third book, Full Moon. But I can also say that there is nothing easy about writing a murder scene like this one. (Those of you who have already read HM, will understand). I cried a lot. I got sick to my stomach and I was basically a walking heap of torment for days. There are a few people I have asked not to read it, people I know who would have a difficult time with it, but for the rest of you, I hope you will give it a chance. It will be a difficult 70 pages, that hopefully you’ll think was well worth it once you get to the last book. Angela is to come AFTER Winter Solstice in the order of the books. 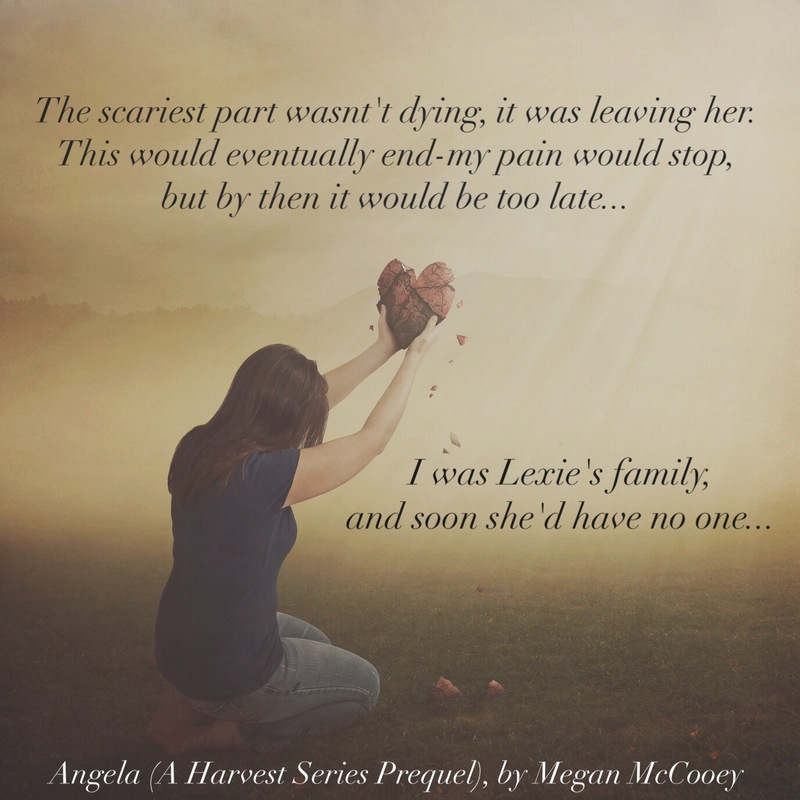 I wanted to share some great teasers for Angela and maybe even one for Winter Solstice too!! These first two I posted a while back, but I’ve redone them and wanted to share the updated versions. The last one I think sets the stage for the mood of Winter Solstice. We are getting so close to the release now and I hope you’re getting just as excited as I am. Thank you to everyone who has shown interest in reviewing/blogging etc. Keep it coming!! The release of Winter Solstice is on the horizon now (hopefully first week of July) and I plan to start releasing some fun stuff to get things started. I’m also hoping to find some bloggers to do pre-release reviews, maybe get a blog tour set up and start taking orders for pre-release signed copies. So if you’re a blogger and you’re interested, please by all means, let me know!! If you’re not a blogger, but you’d like to review WS, contact me. If you are interested in a signed copy before it goes live to the world, there is an order form under merchandise, please fill it out and I will be sure to add you to the list. *(All pre-orders will come with two bookmarks and two postcards for the series). And remember, there is other swag available for purchase too. 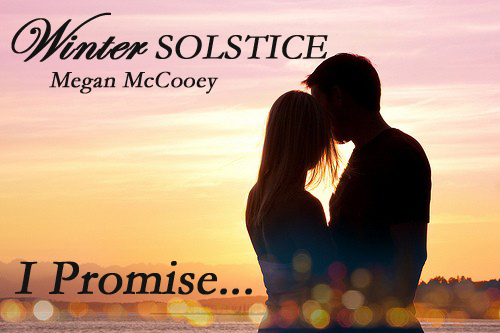 Okay, so here are a couple of new teasers for Winter Solstice… Stay tuned for more!! !